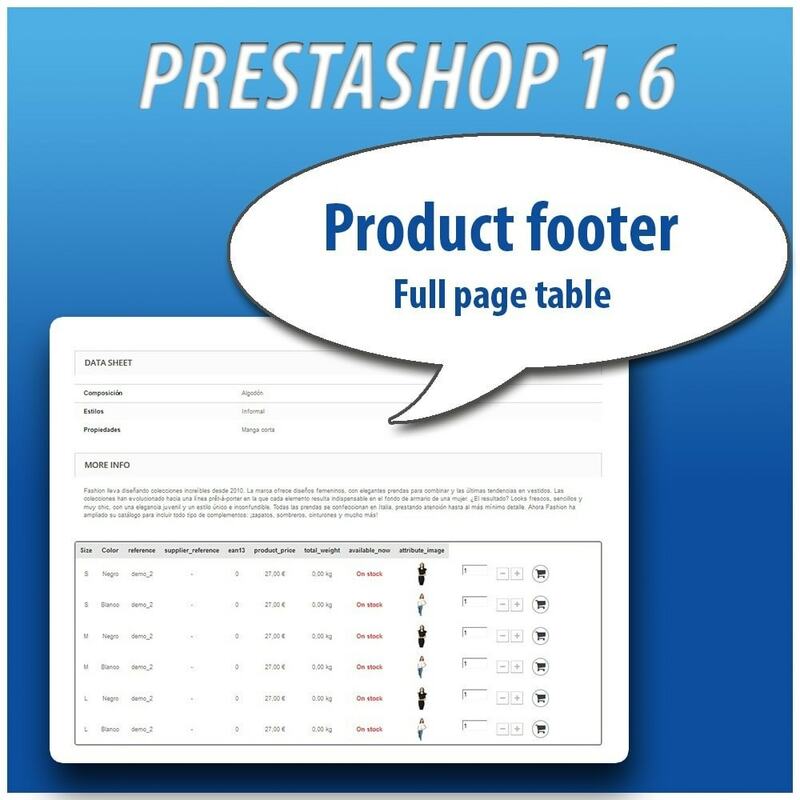 The module has a configuration page to add the items to be displayed in the table, as well as more display options and advanced parameters.The table is fully configurable in language and styles. With this module is added the function of being able to display the product combination table to show customers a quick view of each of the combinations and their characteristics.As an additional feature, the customer can add to the cart each of the combinations through the table. - Option to display the combination table for all products or by product ID. - Option to display the combination table only for customer logged. 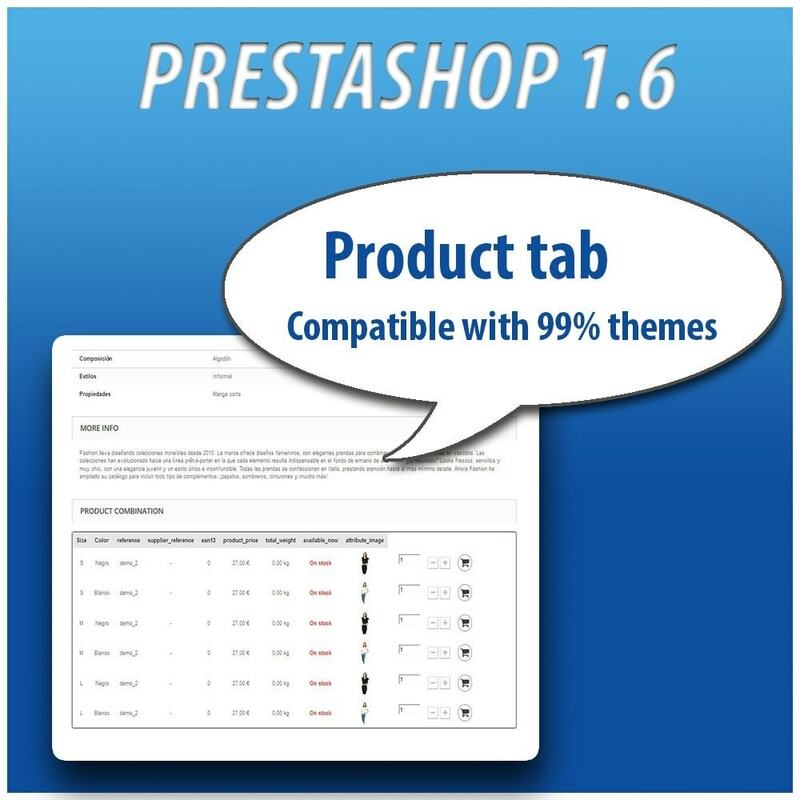 - Option to hide the selectors of combinations by default (Product page). 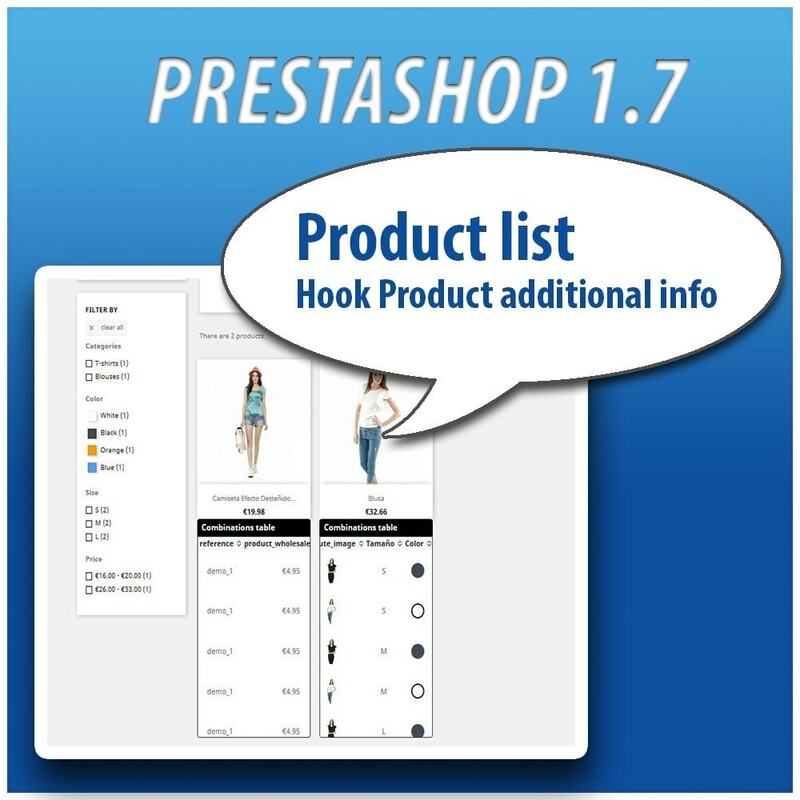 - Displays the table in different selectable hooks of the product listing and the product page. 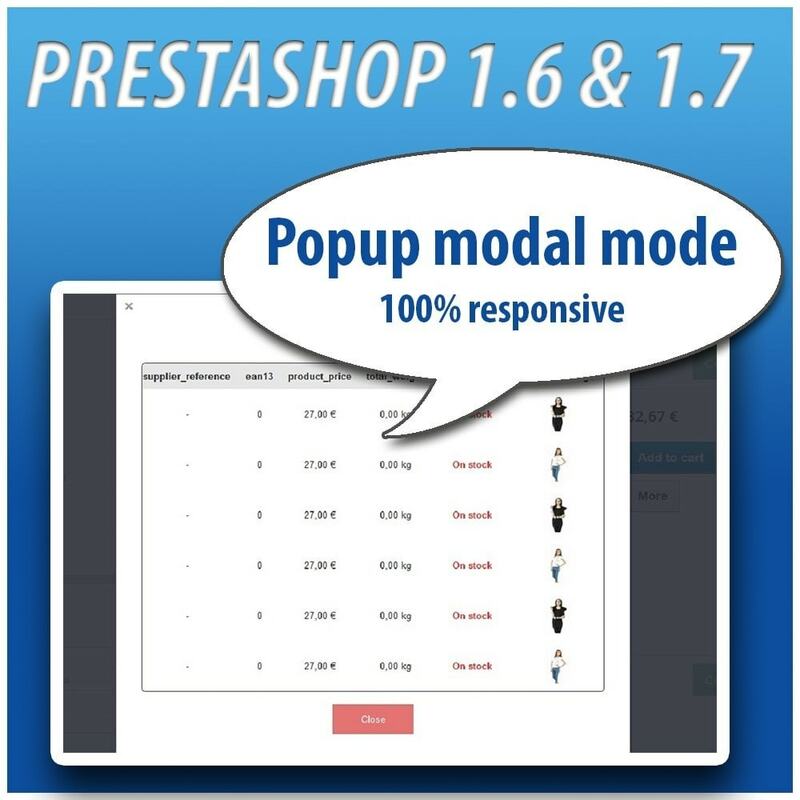 - Display the table in a modal type popup window (responsive). 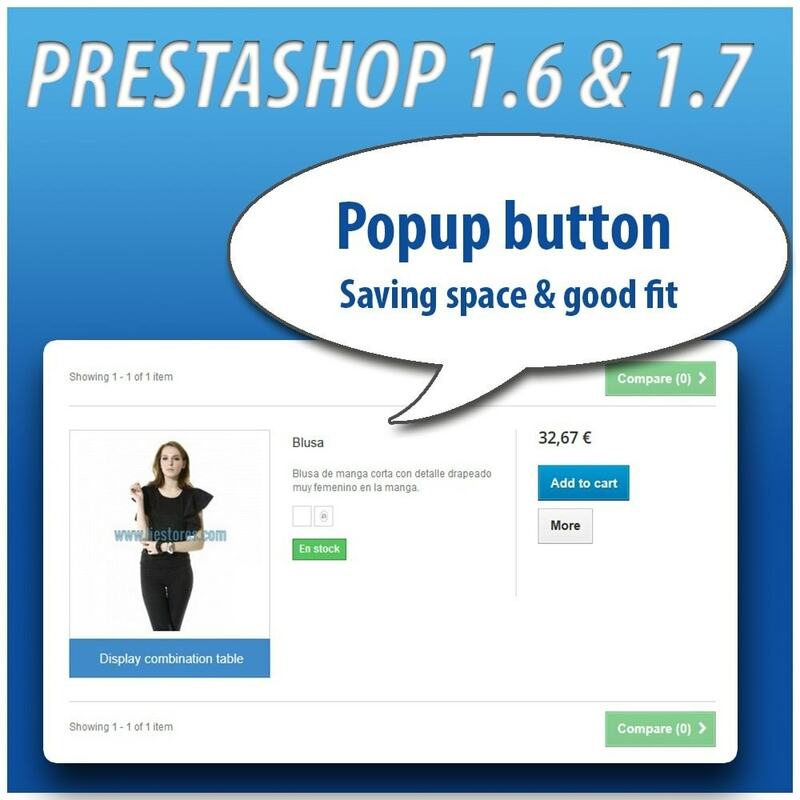 - Display modal in producto list or product page separately. 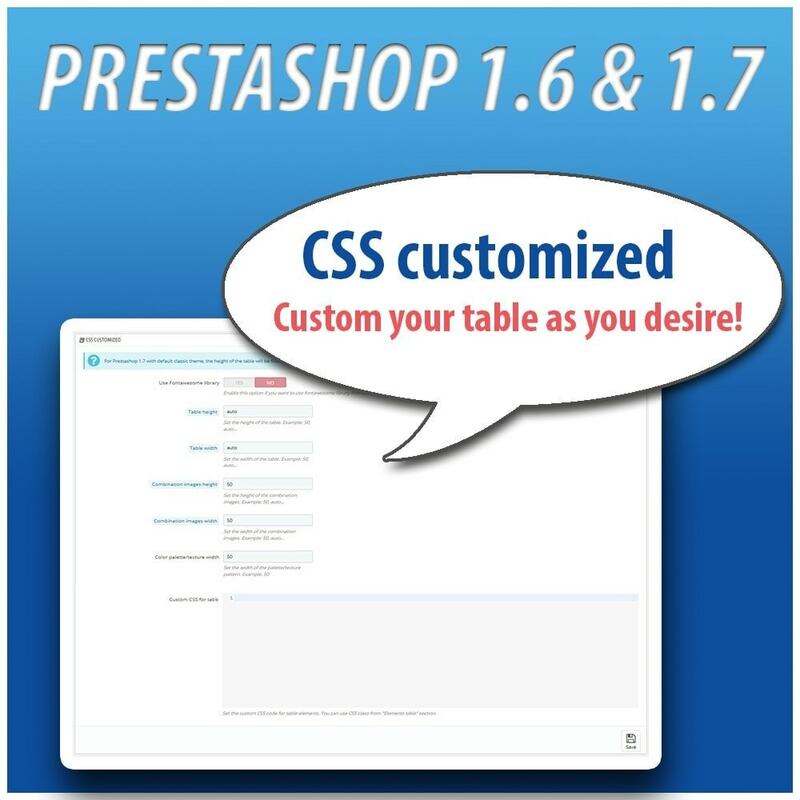 - CSS style selector of the table. - Responsive table with vertical and horizontal scroll. - Scrolling function by clicking and dragging with your finger or mouse. - Filter/search function in two method (dropdown or search input). - Fully configurable table in styles. 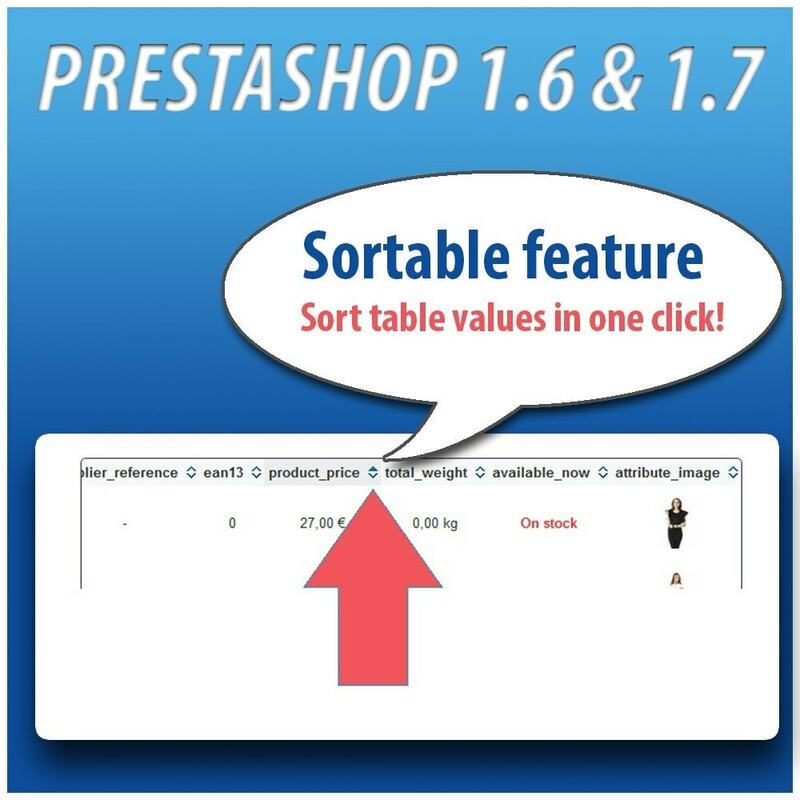 - Function of sorting values ​​of the columns. - Each column is assigned a configurable CSS class. - Option to display the image of the combination or color texture in the main container when the mouse is hovered above the combination. - Displays from which units the discount starts. - Displays old price crossed out when there are discounts. - Option to display color texture image. - Option to set the size of the color combination and texture images of the table. - Lightbox function to display the complete images. - Option to show the different sizes of the combination images. 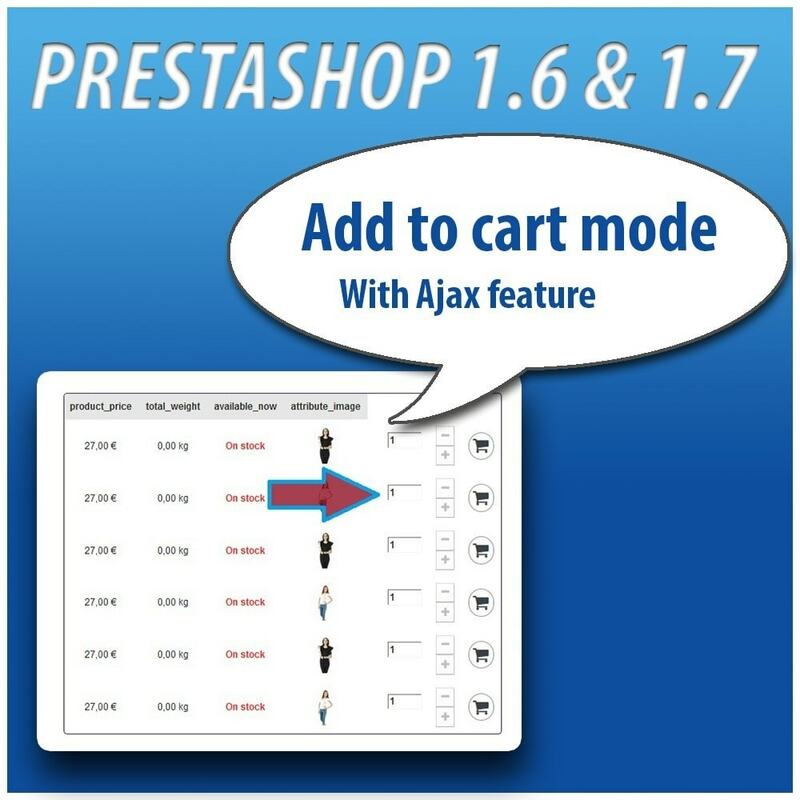 - Option to show button to add each shopping cart to the shopping cart and quantity selector. - Option to hide combinations out of stock or not available for orders. - Option to configure empty fields. 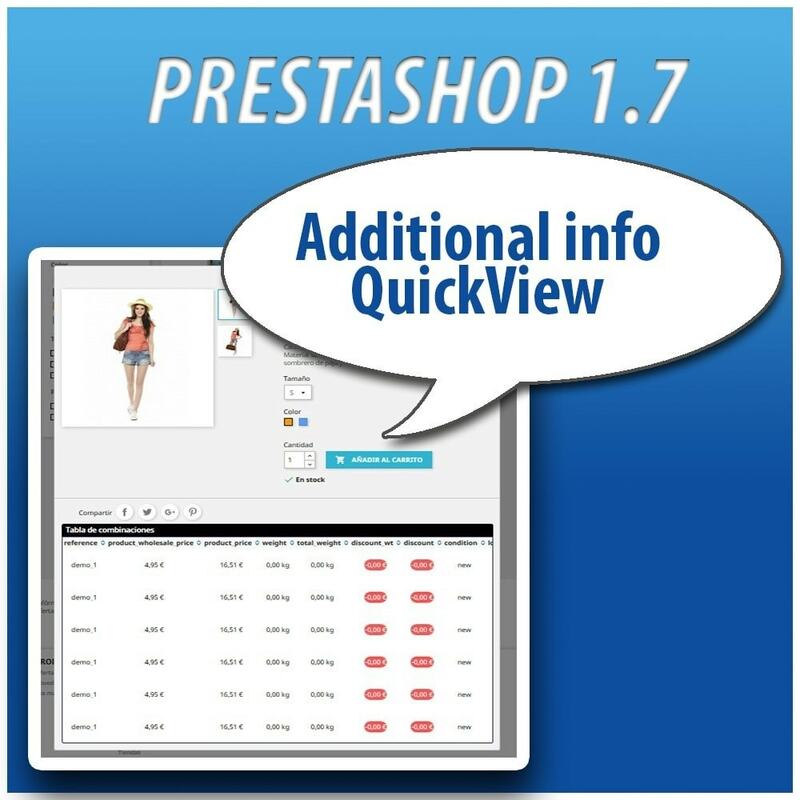 - Rich editor for Table title and modal button. 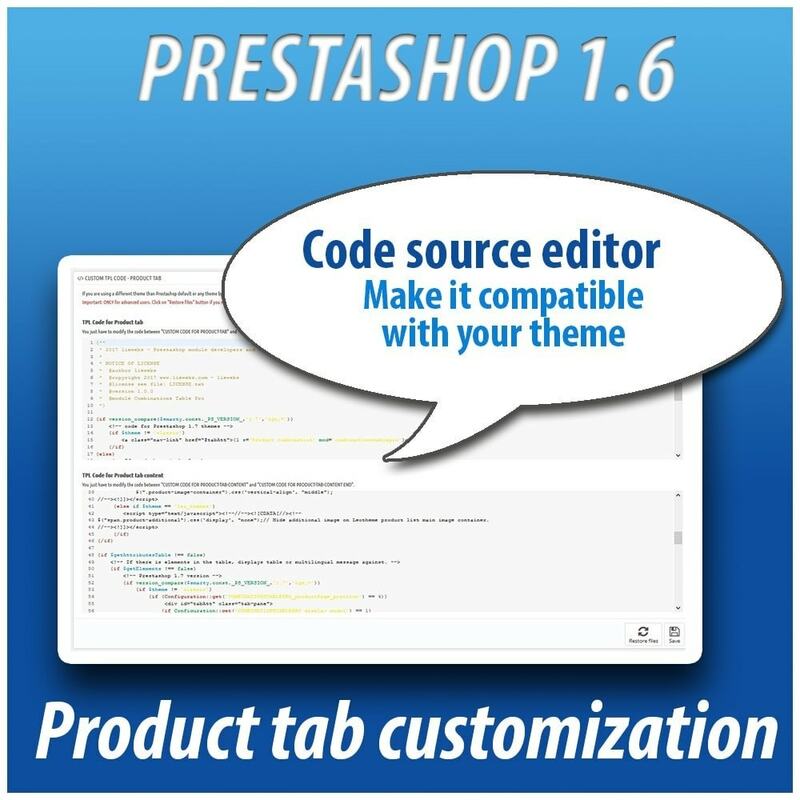 - Compatible with ALL templates on the market. 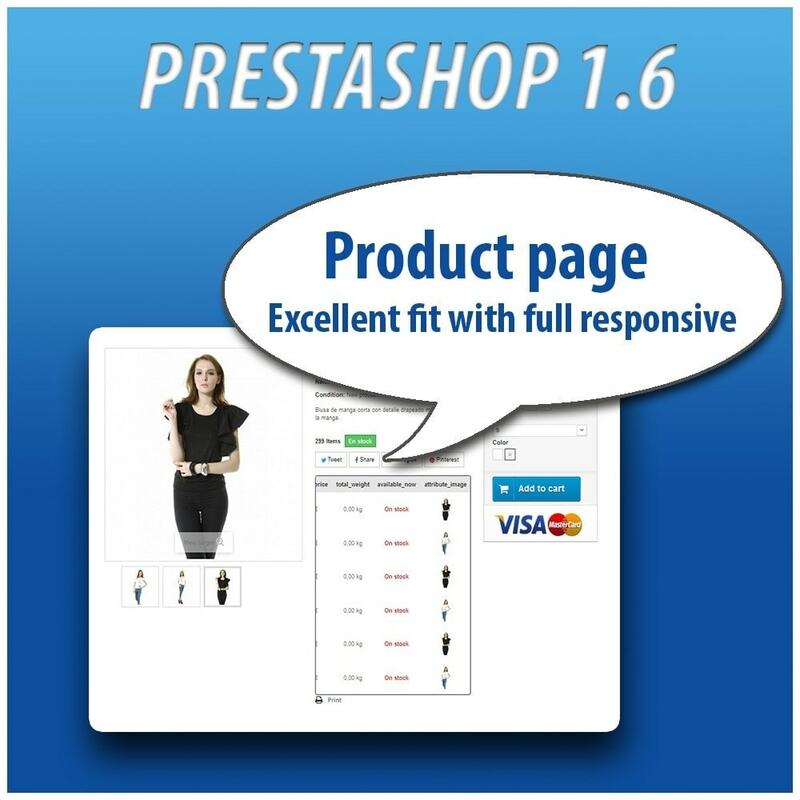 Especially the default Prestashop templates and those designed by Leotheme. - This module is compatible with 90% of the templates in the market.It is possible that in a very small number of templates a code modification must be performed in order to be able to display the combinations table correctly. 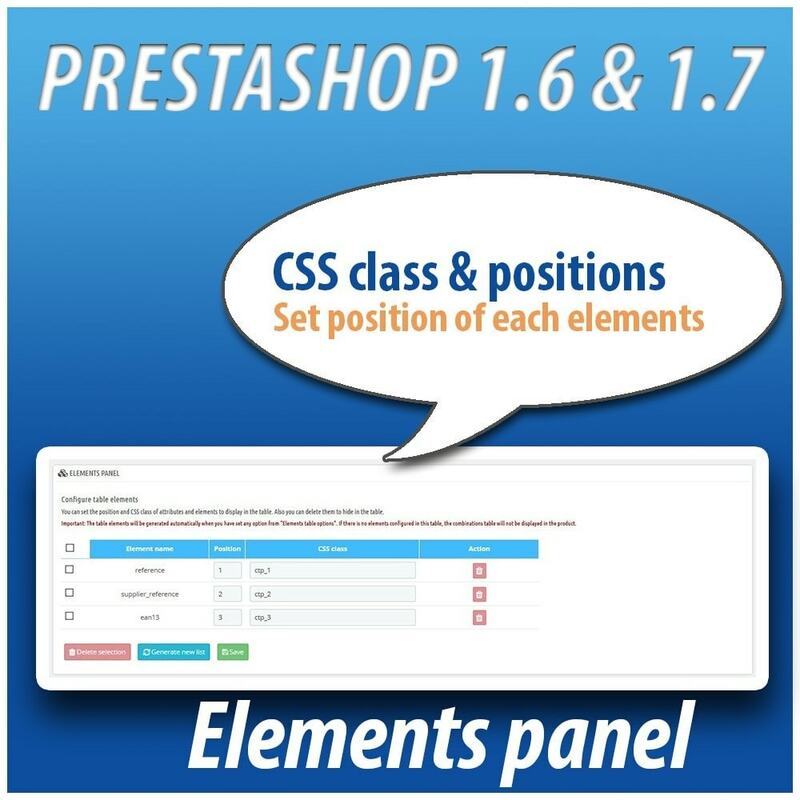 - To visualize the table of combinations in the product tab, in templates that are different than the default in Prestashop, you must carry out a customization of the code within the options of the module. ONLY FOR ADVANCED USERS. Customers can view a table of product combinations on the product-listing page and the product page.You can access the different combinations and know all the characteristics of each one (prices, references, quantities, discounts, etc ...), quickly and very intuitive. Another characteristic is that the customer can add to the cart the product with the different combinations shown in the table. The table is responsive and adaptable to all mobile devices.The client will be able to navigate the table by scrolling with the "drag" function with the mouse or with the finger (on touch screens). For stores with a large number of products in the catalog, we recommend installing this module on servers with a lot of resources. PHP version: We recommend using 5.4.16 or higher. We highly recommend to activate smarty cache in BO performance options. This module uses smarty cache to increase performance and reduce loading time. 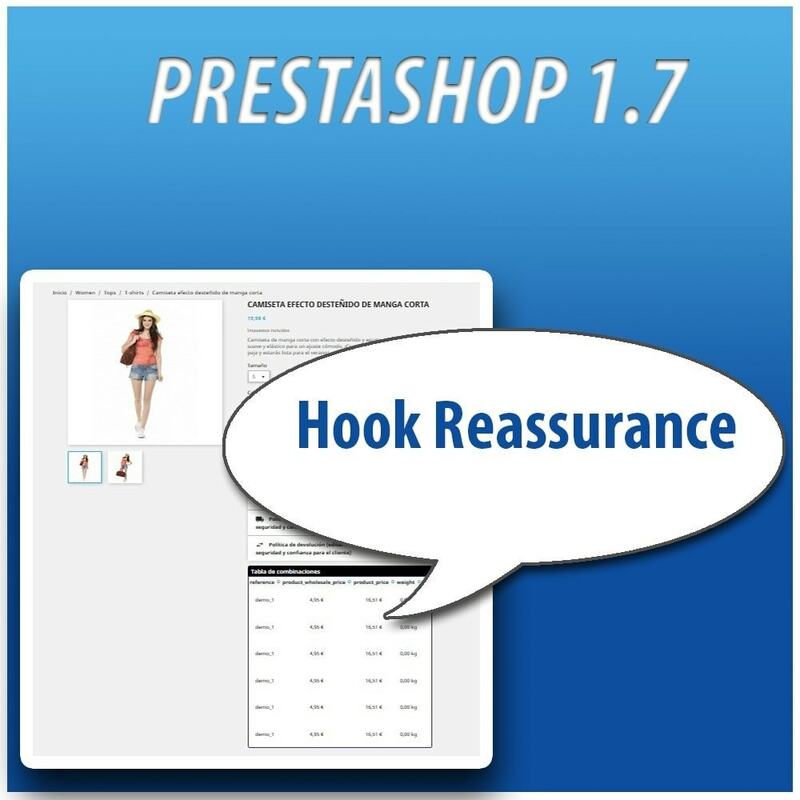 The installation is very simple and identical to any official Prestashop module. 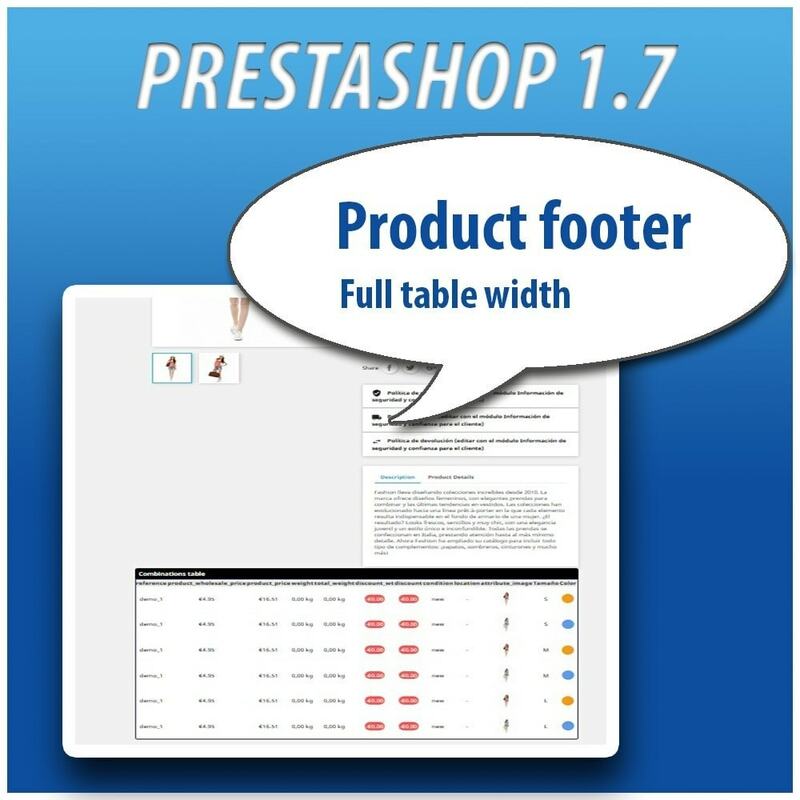 - [FIX] Issue when select product ID to display table.